Recchi Engineering : XTREME XPERIENCE LAND. First prize goes to the team led by RecchiEngineering. XTREME XPERIENCE LAND. First prize goes to the team led by RecchiEngineering. The team supervised by RecchiEngineering – and composed of Frigerio Design Group, Livio Dezzani’s Immagine e Territorio, Ermanno Maritano and Stefano Ponzano – won first prize in the international concept design competition, launched by ENEL, for the re-use of the gas turbine power plant in Alessandria. 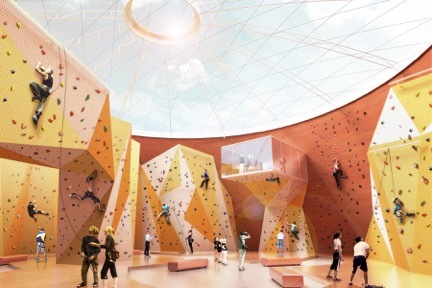 The winning project XXL (Xtreme Xperience Land) involves the design of an extreme sports park on a unique site: a disused thermoelectric power plant. The idea preserves the memory and identity of the industrial structures, which provide the perfect setting and container for these activities. The only brand new element is the “building-path” which leads visitors through the site and also houses ancillary services. The cistern, once used to treat waste water, will be converted into an auditorium with a seating capacity of 150. This will be used for conferences, team-building sessions and educational activities. It will also guarantee the use of the facility during the week. The project idea emerged from the desire to redevelop the site without losing its historical memory, minimizing the necessary demolitions and trying to reuse the existing facilities while enhancing their dramatic spirit. The panel of judges chose this project for its excellent design, and for its innovative and sustainable use of the existing structures. They found the concept to be innovative in terms of both its architectural and management solutions: the idea builds on the industrial identity of the power plant, making reference to its previous use by maintaining many existing structures, which have been converted for sports activities. The judges considered the idea to be based on an interesting and profitable business model, that will attract attention to the area and so have implications for employment in Alessandria, especially for young people.